The Gun & Foam Cleaner is designed for flushing out residual expanding foam from the Gun Applicator and the can screws directly onto the gun body. The cleaner is also supplied with a spray cap nozzle and can be used for removing any excess uncured (wet) landscaping foam. 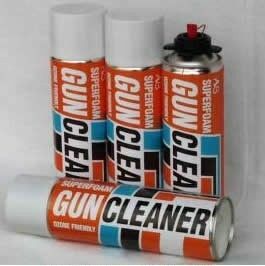 GUN & EXPANDING FOAM CLEANER CAN ONLY BE DELIVERED TO UK MAINLAND ADDRESSES.